Climate: Because of the variety of landscapes, Peru has a wide diversity of climates. In fact it has 28 of the 32 world climates! In other words, when packing your suitcase, you should be prepared for all weathers if you are going to travel across it! – The Amazon Rainforest makes up half of the country and the Andean mountain range also passes through it. 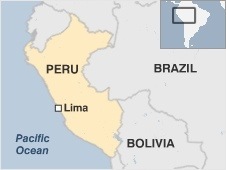 – Peru is said to have one of the world’s fastest growing economies. – The city of Cusco was the centre of the Inca Empire and there are many fascinating archeological sites nearby. One of which is the World Heritage Site, Machu Picchu. – Two of the national dishes of Peru are guinea-pig (cuy) and marinated, raw fish (ceviche). – One of the most popular soft drinks in Peru is called Inca Kola. It is bright yellow and tastes like bubblegum!